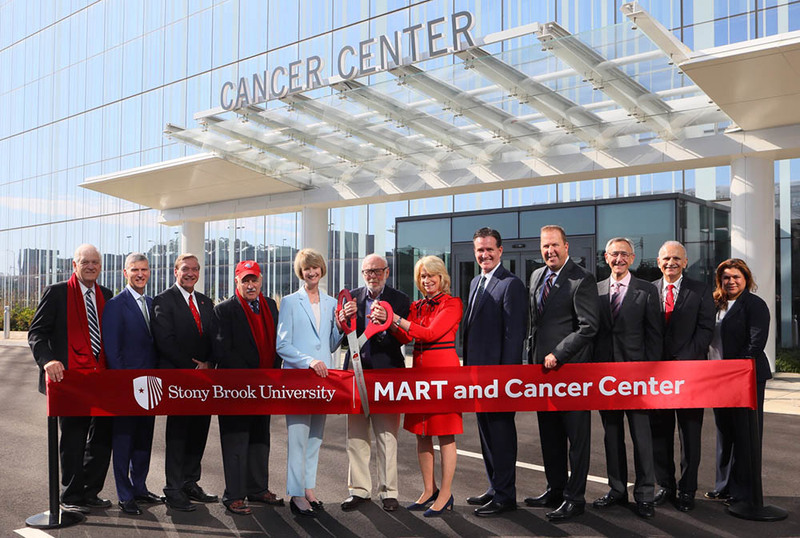 Stony Brook University and Stony Brook Medicine celebrated a momentous milestone on November 1 with a ribbon-cutting ceremony for the new Medical and Research Translation (MART) building and Stony Brook University Cancer Center. Stony Brook leaders and staff toured the state-of-the-art facility, which will change the future of cancer care through revolutionary breakthroughs, medical discoveries and lifesaving treatments for patients with cancer on Long Island and beyond. MART ribbon cutting, November 1, 2018. Left to right: New York State Assemblyman Steve Englebright; SUNY Trustee and Stony Brook Foundation board member Cary Staller; Stony Brook University President Samuel L. Stanley Jr., MD; New York State Senator Kenneth P. LaValle; SUNY Chancellor Kristina Johnson; Jim and Marilyn Simons; New York State Senate Majority Leader John Flanagan; Kevin Law, President of the Long Island Association and Chair of the Stony Brook Council; Kenneth Kaushansky, MD, Senior Vice President for Health Sciences and Dean of the School of Medicine; Director of the Stony Brook University Cancer Center Yusuf Hannun, MD; representing Governor Andrew Cuomo, Marta Santiago-Jones, Consultant Nurse Hospital Services Administrator at the New York State Department of Health. Located on the Stony Brook Medicine campus and connected to Stony Brook University Hospital, the MART offers expanded space for patients and families in an environment that promotes healing, fosters research and offers hope for new ways to cure and prevent cancer. With eight stories and 240,000 square feet, the MART is made possible in part by New York State Governor Andrew M. Cuomo, the State University of New York and Empire State Development through a $35 million NYSUNY 2020 Challenge Grant, $50 million in support through a historic $150 million gift from Jim and Marilyn Simons and $53 million in support from New York State Senators John Flanagan and Kenneth LaValle. “Stony Brook is a wonderful place to help, and Marilyn and I are so pleased to be a part of it. We all know the graduate school and medical school are outstanding,” Jim Simons said. 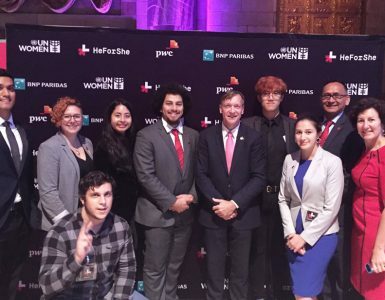 “In addition, the undergraduate programs take in a great many students who are first in their family to go to college and get an education. And it’s gratifying to see these students graduating faster than ever. This University has it going well in every way, and I’m grateful to have been a part of it”. 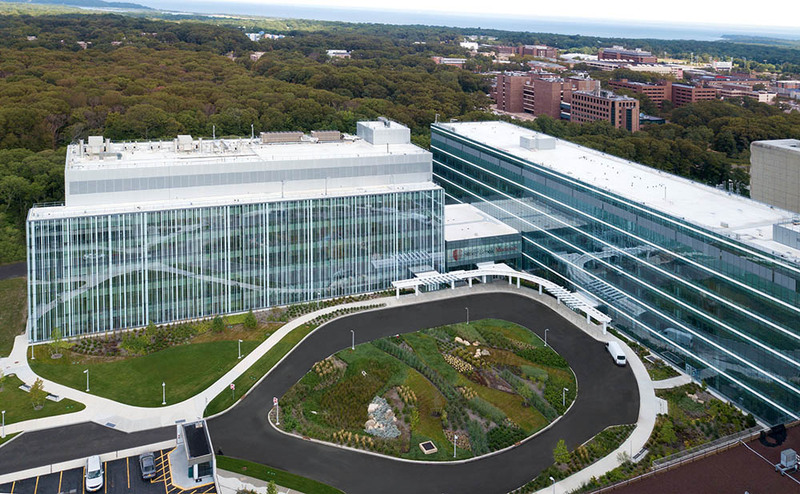 The MART is a state-of-the-art facility which will change the future of cancer care through revolutionary breakthroughs, medical discoveries and lifesaving treatments for patients with cancer on Long Island and beyond. “Throughout my tenure as state senator, I have made access to quality, affordable healthcare a top priority,” said New York State Senator Kenneth P. LaValle. “The MART will deliver state-of-the-art care to my constituents close to home. I congratulate Stony Brook Medicine on this milestone, which will bring the most advanced patient care and treatment technology to this region. Outpatient clinical care will occur on Levels 5 and 6 of the facility, with medical oncology provided for both children and adults. For pediatric patients, there is child-friendly exam space with private pediatric infusion rooms. Adult patients are cared for in private treatment spaces and have multiple setting options for infusions, including comfortable seating areas and a fireplace to promote conversation among patients. Additional patient-centered amenities address the personal needs of patients and their families, including a resource center, wellness room for yoga, beauty salon and a boutique providing prostheses, wigs and mastectomy apparel. This focus on cancer research translates into an advanced program in clinical trials and translational research at the MART, where Cancer Center physicians can ensure that their patients have access to the latest approaches that are being developed either at Stony Brook or elsewhere. The building also houses the Kavita and Lalit Bahl Molecular Imaging Laboratory, where a cyclotron (particle accelerator) will be used in conjunction with a nearby PET scanner to enable cancer researchers to develop unique ways to more precisely target tumors. The cyclotron was funded in part by $500,000 awarded by New York State’s Long Island Regional Economic Development Council. A first-in-human clinical trial using CAR T cell immunotherapy for patients who are suffering from extremely difficult-to-treat T cell lymphomas and leukemias. Demonstrating improved survival outcomes for lung cancer patients treated under a multidisciplinary model of care. Pioneering new tests for early detection of urothelial cancers – among the most common cancers encountered worldwide. 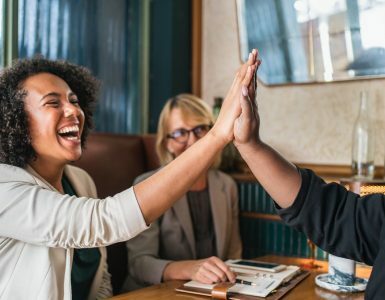 Inroads in demonstrating that genetically manipulating and removing the most common mutant form of the p53 gene that promotes colorectal cancer in humans reduces tumor growth and tissue invasion. 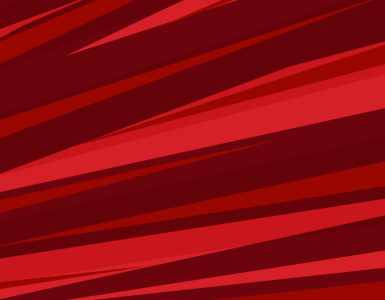 These are just a few examples of the vital work being conducted at Stony Brook that will launch the University to the forefront of cancer research. 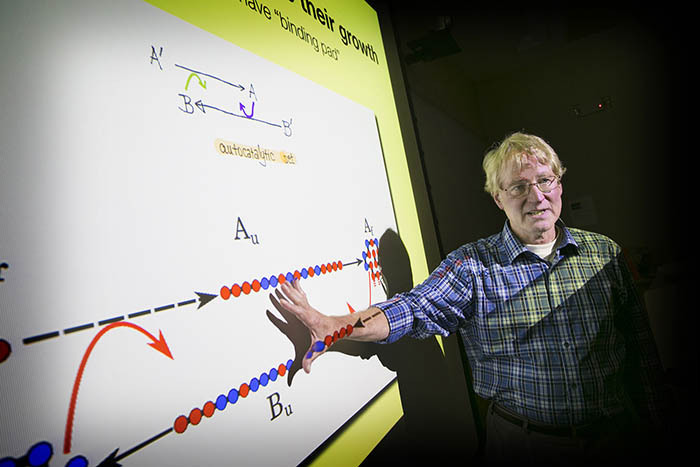 Stony Brook’s expertise in bioinformatics – the study of biochemical and biological information using computers – will broaden discoveries in cancer biology by enabling comprehensive analysis of data relating to genes and proteins. As part of Stony Brook’s mission to educate the healthcare professionals and biomedical investigators of the future, medical education will take place in a spacious 305-seat auditorium and 10 classrooms that can accommodate more than 300 students. The new classrooms are equipped with state-of-the-art audiovisual technology to record educational activities for later viewing, with flexible seating that’s easily configured for small-group learning activities. The ribbon-cutting included tours of the facility, as well as two Ted-style talks by Aaron Sasson, MD, Professor and Chief of the Division of Surgical Oncology and Interim Director for Cancer Center Clinical Operations, and Laura Hogan, MD, Associate Professor and Chief of the Division of Pediatric Hematology/Oncology. To learn more about the MART and Stony Brook Cancer Center, visit www.thischangescancercare.com.